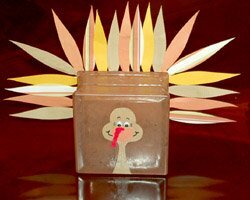 This glass block turkey is a beautiful Thanksgiving decoration you can make! It looks very pretty when it is lit up. 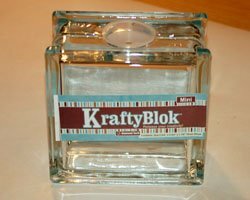 Glass blocks are sold at craft stores, specifically to be used for crafts. They come with a hole already in the bottom so you can stuff lights inside. They usually come in two sizes, 5.5 inch and 7.5 inch. Be sure to use a heat resistant glue to add the feathers. 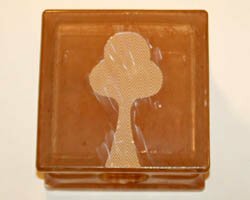 The glass block warms up after awhile when lit, so do not use a glue gun or the glue will become soft. I used a special heat resistant glue that I found at Wal-Mart in the craft aisle for $2.50. A two-part epoxy glue would also work well. Or, try using LED lights since they do not generate much heat. 1. 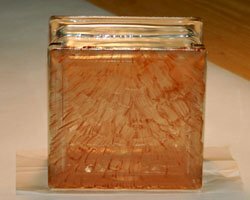 To begin the glass block turkey craft, clean the glass block well and allow to dry. The glass block will be the turkey body. 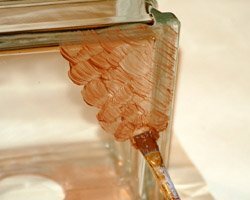 Paint the entire block with brown glass enamel paint. Glass enamel paints are sold in the 2 ounce size, right by the acrylic paints. The difference is that they can adhere well to glass and are translucent. This means you will see your brush strokes well. Use small strokes, as shown, to resemble a "feathery" look. Allow this to dry completely. 2. Cut out a turkey head from the paper of your choice. For this project, I used a pad of coordinating Fall Color scrapbook paper. All the designs are meant to go well with each other so this worked out great. You could also use solid brown cardstock. 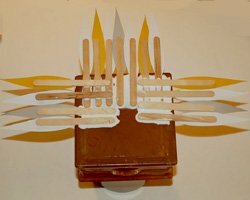 If you would like a copy of the pattern I used for the head, beak, wattle and leaves, click here. A PDF file will open in a new window. 3. 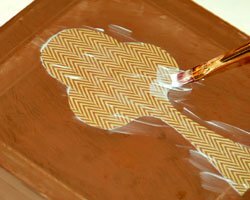 Using decoupage medium (such as Mod Podge), glue the head on the center of the glass block, using a paintbrush. Paint the top of the head with decoupage medium. Everything will dry clear. If you do not have decoupage medium, you can also thin out some white glue in water to use instead. 4. Next you can Add the facial features. I chose to cut out the beak and wattle from orange and red paper, and painted on a smile with black acrylic paint. Everything was adhered with decoupage medium (I used Mod Podge). You could also choose to paint on the face using acrylic paints. Either paint on some eyes, or glue on some googly eyes like I did. Other ideas are to use a pistachio shell half as the beak, and a small deflated red water balloon as the wattle (see the pinecone turkey craft for this idea). 5. Now it is time to cut out the feathers. I cut out 19 feathers for a small glass block. 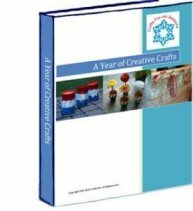 If you would like a pattern, click on the link in step 2 above which will open up a PDF file for you. I cut out my feathers using my Cricut die-cut machine. 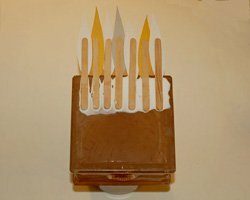 If you have a Cricut and the Cricut DesignStudio software, I morphed the leaf from the Plantin Schoolbook cartridge to 5 inches long by 1 inch wide. 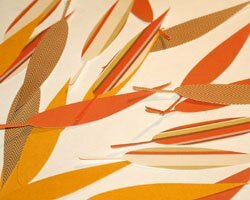 Cut these leaves out on different patterned paper, or simply choose different fall colors of cardstock. 6. 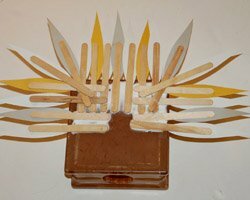 Glue each feather to a wooden craft stick (popsicle stick) using regular white glue, as shown. Allow them to dry completely.
. Using a heat resistant glue, adhere each feather to the back of the glass block, as shown. I began with the feathers on the top of the glass block, then glued the feathers on each side of the block. Last, I added two feathers on each corner to complete the tail feathers. 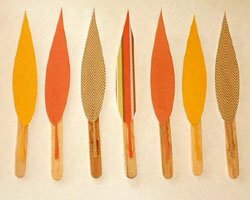 These feathers on the corners will have to overlap the other craft sticks, so use plenty of glue. Do make sure to use a heat resistant glue, and not a hot glue gun. This is because the glass block gets warm after the lights have been on awhile. You can also use a string of LED lights inside, which do not generate as much heat. 8. Take your time and stuff the string of lights inside the glass block turkey. I used a string of 70 lights, which was tight fit but it does look nice. A 50 strand light would probably be best. 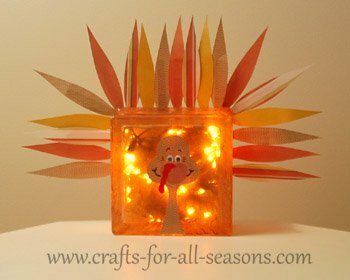 The best part is the glass block turkey looks so cute whether it is lit or not. Enjoy!